I don’t imagine there was any possibility that we could have escaped this election cycle without one of these. There’s always a one-dimensional totem, a stupid prop suitably dumbed-down for the sweatpants and threadbare Bon Jovi tee-shirt crowd in the cheap seats watching six minutes of news spread out over every two days. We expect as much from the McCain-Palin campaign, which has proven itself shameless in jettisoning anything that brings with it the unmanageable burden of verisimilitude, but it’s a shame that Barack Obama got into it up to his thighs in this undignified enterprise. Usually it’s just an anecdote, like Ronald Reagan’s apocryphal “welfare queen” who had “80 names, 30 addresses, 12 Social Security cards” and drove a phat Cadillac thanks to her surfeit of unlawfully-obtained government dollars. Reagan deployed this phantom woman–who was really an amalgam of a handful of worst cases of welfare abuse–as an example of the typical welfare recipient and his justification for dismantling the social safety net in America. I TiVo’d this third and last Presidential debate of the 2008 campaign since I knew I had to work late last night. But I was in my car listening to the showdown about twenty minutes in when I started hearing the invocation of “Joe the Plumber.” I thought at first that it was a generic citation, like “Joe Six-Pack.” Then it came up again and again. By the time I’d made the 19 miles from Tigard to the Interstate Bridge heading over to Vancouver, I’d heard “Joe the Plumber” cited no less than a half-dozen times. By the time I made it out of my car and hauled my groceries into the apartment, it had passed curious and moved onto annoying. I finished a quick beer and a cigarette outside and rewound the TiVo, and came back to at least eight more questions about how Obama and McCain’s economic policies would affect Joe. It had been less than an hour since myself and the rest of America had heard tell of Joe, and it only took about ten minutes more, through the candidates’ closing statements and into the post-debate analysis, before this curiosity had become a craze and we’d officially entered the realm of the absurd. I fell asleep with the TV on CNN and the entire night was a fever dream of men with crescent wrenches, pipe cutters, and lunch buckets sitting around a table during a Cabinet meeting as President Joe the Plumber urged the invasion of Brazil to claim their water resources and how formally encouraging his “If It’s Yellow, Keep It Mellow; If It’s Brown, Flush It Down” Wastewater Evacuation Policy could save Americans nearly $180 billion on their water bills every year. The elite were the plumbers, and the rest of the world were worker bees that labored to keep them supplied with PVC tubing. I don’t remember exactly what I was doing in the dream, but I know I was wearing Carhartts. I awoke to a world more profoundly retarded than the one I’d left behind just six hours earlier. 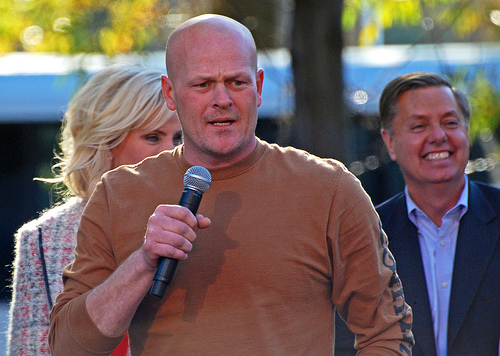 Joe the Plumber had become a full-fledged phenomenon, with Joe the Plumber hoodies, boxers, and women’s spaghetti tanks all over the Web. Joe was on the television opining about Social Security, taxes, and getting government off our backs. He marveled at the attention and hoped aloud that maybe this newfound notoriety could open some doors that had forever been closed to him. With an alacrity only possible in the Internet age, though, by the time I showered, hopped in the car, and turned on the radio, it was apparent that the Joe the Plumber mania had peaked sometime between when I was packing my lunch and flossing my teeth. Six blocks from my house, through the intersection I’d come from the other direction just twelve hours earlier when I was learning about Joe on the radio for the first time, it was clear that the Joe the Plumber backlash was on. With a vengeance. He isn’t properly registered to vote. He has a tax lien filed against him for unpaid property taxes. The business that he wants to buy doesn’t pull anywhere near $250,000 a year–his boss fixes toilets and leaky faucets, and operates his business out of a back room in his house. Joe made about $40,000 in 2006. His name and the name on his voter registration don’t match (just the kind of fraudulently-registered voter that Ohio Republicans are screaming to exclude from voting). And he’s not even a licensed plumber. It’s Friday now, and Joe the Plumber is a distant memory, another relic of one of the most bizarre elections that most of us can remember, a fleeting distraction from a frenzied moment in time–and we’re still 18 days from the actual election. This is just a slice of the bizarre time warp that passes for democracy in 2008. We’re going to witness a dozen or two more operas played out in the next two and a half weeks. Whoever is the protagonist onstage when the clock strikes November 4th will probably be the victor. Welcome to 21st century electoral politics, on truck-driver amphetamines.